My MAC collection is small compared to others but I'm really picky with what colors I choose. I thought I'd do a show and tell since everyone else has done a similar post before. I also have the Smoke and Diamonds from the starflash collection that I haven't depotted yet but it will go in the Color Palette. Eventually the plan is to only have purple and silver shades in this palette and put my green shades in a third miscellaneous palette. I have a list of about 10 more shadows in the permanent line that I'd like to get. I have a small limited edition palette from several years ago. I'm embarrassed because I should have tossed it, but it has the Sumptuous Olive eyeshadow that is my absolute favorite going out shade. I also have the Mineralized Blush Duo in Love Rock still in the container and it's probably the color I wear the most. I've already picked out the two blushes I want to complete the palette. I have the world's sweetest mom! So I didn't realize that my neice was selling magazine subscriptions for a school fundraiser (yeah, she was in kindergarten a grand total of 4 days before they had them fundraising). Anyway mom called and let me know she purchased 13 issues of InStyle Magazine for me! I haven't had a magazine subscription in a couple of years, it was a luxury I had to give up in college. This is such a great gift idea and I never thought about it. Fall is here, today was the first day it has actually been cool enough for it to feel it officially. I said back in the summer when I bought my Candles by Victoria, I wanted to save the gingered apple crisp for autumn. I lit it for the first time tonight and it is amazing! Actually I had it lit for about 30 minutes and all I could think about was baked apples so I looked up a recipe for apple crisp to make soon. The size of this candle is perfect for me, I could smell the fragrance all over the entire apartment. Here is the candle lit, I wanted to take a photo of the pretty crumbly cinnamon top before it melted away. I've used my others candles from the summer order so I'll need to make another CBV purchase soon and maybe get a couple holiday scents. And just for fun this is Lilly in her new neckerchief. Walmart had these in the pet section for halloween. I love the skull print and Lilly can totally rock it. She'll probably wear this on halloween when the kids come around for candy and all through football season as we cheer on our Pirates! So fall also means good tv! I'm so excited about the new seasons of my favorite shows. My DVR is set, I have popcorn and wine on stock and I'm now working out eariler so I can get ready for bed before my shows start. Some of my favorites are: Greys Anatomy, Desperate Housewives, House MD, and Ghost Whisperer (shhh I'm embarrassed about that last one). There are also some new shows that I'm going to try to get into. In other news I'm hoping to plan a few get togethers with my college and high school friends for the holidays. These upcoming three months are my favorite of the entire year. I live near the mountains and I'm planning a drive hopefully towards the end of the month to see the color change. I've also started making my Christmas list (I'll buy most of the gifts during Black Friday shopping). If anyone has any ideas what to get a 5 year old little girl and 2 year old little boys please let me know! I tried to rate my nail color based on the quality of formula, pigmentation, and how often I wear them. The picture shows the polishes in descending order (just my opinion!). #5 Sally Hanson Salon Nailcolor in Haute Chocolate - The perfect shade for fall. I was a little timid to try brown on my nails afraid it would look muddy but this color has just enough red and gold reflects in the formula to make it a beautiful coppery brown. I usually wear this on my fingernails but it looks great on toes as well. #4 OPI Don't Think Just Pink - This is a dirty pastel pink with blue undertones. The color looks great on my toes and hands. The color is a satin formula with no reflects. This is one of the few OPI colors looks great with 1 coat or 2 depending on how sheer you want it. #3 OPI Done out in Deco - A dusty purple-gray that gives perfect coverage in two coats. The formula is super creamy without reflects. Gorgeous on hands and feet. #2 OPI Dutch Tulips - No other nailcolor I have ever owned complimented my skintone (fair/light) the way this color does. It's the perfect shade of red that's "not quite red" - like that color in the crayon box that's red but not quite the reddest red. I usually wear this on toes only and it has been repurchased. #1 Essie Mademoiselle - Hands down the one I reach for the most. This is the "my nails but better" color. I love one coat for a natural look and two if I want it a little more opaque. I have repurchased this color and it will not be long before I'll need to again. I like this one for the fingernails and something bright and opaque on the toes. I have been buying products from Sally's for years. My little small town didn't have an Ulta, Target, or a posh Salon but we did have a Sally Beauty Supply! I have a Sally's card which I have to purchase every year for $5, the first receipt after getting the Sally's card will have a coupon for $5 off the next purchase so it more than pays for itself. 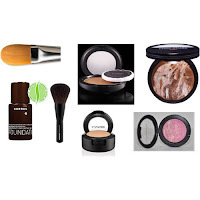 I thought I'd share current products I own and love from Sally's. China Glaze and Finger Paints Polishes They're easy to find and often go on sale at Sally's. My local store has a nail swatch of every single color which makes it so easy to find the perfect shade. Tanwise Self Tanning Mousse Readily available and works very similar to the St. Tropez on my skin with slightly more lasting power. I have reviewed this before on my blog. Brushes and Combs I've owned several over the years but I wanted to give two recommendations: Mebco High Volume Comb, I've owned 3 of these in my lifetime and I've used this comb since I was 5 years old - I absolutely will not be without one. The other is the Jilbere Tourmaline Oval Cushion Brush which is an amazing quality brush for the price and a must have if you have frizzy hair. Alligator Clips Really all of their hair clips are great but it can be hard to find the packages of metal alligator clips in other stores. I love them and use them everytime I blowdry my hair. Beauty Secrets Ridge Filler This is a huge necessity for me especially if I'm going to have a dark or more matte color on my nails. Sallys also carries the infamous Seche Vite top coat that everyone loves. The Generic Value Product (GVP) Hair Care line You cannot beat the value for the money here and they often go on sale. Basically these are the generic products of popular salon brands - Paul Mitchell, Matrix, and Sebastion to name a few. The container lists the product ingredients against the salon name ingredients. Specific products I recommend: GVP - Matrix Biolage Color Care Conditioner GVP - Matrix Va Voom Fast Drying Hairspray GVP - Matrix Volumizing Fast Drying Hairspray GVP - Matrix Biolage Color Care Shampoo GVP - Joico K-Pak Hair Reconstructor GVP - Paul Mitchell Sculpting Foam GVP - CHI Silk Infusion I've debated for a while whether or not I wanted to try to color my hair at home. One day I might get brave and seek the advice of a Sally's saleswomen to find the perfect semipermanent dye for my hair. I think it might be easier than trying to search for a color myself in the drugstore and of course cheaper than getting all over color from a salon. I have mentioned before that my college mascot was a Pirate and I've actually been a Pirate football fan since I was a little girl. Even though my style is classic and preppy I still manage to add a skull or two and I get excited over any and all pirate history. During my recent trip to Charleston the Provost Dungeon had the Pirate Code of Ethics posted. Pirates adopted the original form of democracy, the captain and all other positions were voted on by the crew and the crew also took a vote to determine punishments. The Carolinas have a heavy Pirate past, Stede Bonnet and his crew were captured in South Carolina and over 40 men were hanged over a 6 week period. A typical Pirate execution involved the man being hanged facing the sea for 3 full tides before being thrown into the water. Blackbeard one of the mo st well known pirates was killed on Ocracoke Island in North Carolina by an untraditional beheading. Just a few historical facts from a pirate who is 200 years too late. I'm a dietitian and food is my life. I get more excited about the food when traveling than site -seeing, so I'm doing a seperate review for the resturants and cafes from our visit. We had a quick yogurt and fruit breakfast at the hotel every morning while we were getting ready for the day so all the reviews are either for lunch or dinner. Poogan's Porch - Dinner Entree - Crab Cakes served with Hoppin' Johns, green beans, Cajun remoulade and Southern Style biscuits with homemade honey butter. "We chose Poogan's Porch because it is a renowned hotspot. It has been featured in movies, many celebrities have visited and it has been rated the third most haunted building by the Travel Channel. Poogan was a dog and they actually barried him in front of the resturant." "This sandwich had jumbo perfectly seasoned and fried shrimp, so many in fact I had to eat it with a knife and fork. Mom ordered the cheeseburger in paradise (100% Angus beef served on toast) and said it was the best burger she has ever eaten. It was a great local hotspot." Entree - Carolina Delight (scallops served in a homemade cream sauce over grit cakes). I chose collards as my side item and the meal came with beer flavored hushpuppies and boiling peanuts to start. "I eat here every time I visit Charleston and it does not disappoint. The travel channel lists this as a top 5 seafood resturant in the US. All the seafood is fresh not frozen and the hushpuppies are a truely unique treat. I loved the boiled peanuts too - the caviar of the South. Many celebrities have visited the resturant, our table had plaques that reported Rick Flair, Samuel L Jackson, and Billy Joel have all eaten at the same table." "I'm pretty hard to please with baked goods, I was a baker all through college. I worked at a posh bakery that make wedding cakes, cupcakes, candy, and all other confectionary goodies. There isn't much that can top MY baked goods. These were ok, I loved that they piled the frosting high, actually forcing me to eat it with a fork or get it all over my nose." "This is a great local lunch spot. Everything is made fresh from scratch, the chicken salad was probably the best I've ever had but the soup was probably the single best thing I ate on the trip. The bananas foster was really good, but you really can't mess it up - I wish more resturants would put it on the menu." Rating - Excellent "Beautiful fine dining atmosphere and great service. The bring out bread with a unique cream cheese / butter spread to start. My salad had incredible flavor, pear, arugula, balsamic / lingonberry vinegarette, toasted pecans and blue cheese crumbles. The bisque was really good too, but I was so full when it came out I had the waitress package the rest up for me." "A nightmare to find, I had heard great things about the food but we got lost trying to find it. Well worth the journey! They bring out herbed wheat breadsticks to start, I'm not a bread person and I could have eaten a pan of these. The soup and crab cake was made the perfect lunch. My pecan torte was really rich, the nuts, coffee, and chocolate really hit you all at once. Mom's pecan pie was heavenly though." (Warning - Picture Heavy Post) Back in July my mom and I planned a fall getaway to Charleston (pronounced Chawl'son by locals), South Carolina. Mom hasn't had a vacation in probably 10 years and of all the cities I've traveled to Charleston was by far my favorite. I can't tell you how much I'd love to live there someday. If you love history, old charming towns, or if you're interested in visiting the epitome of the South - please consider Charleston, you may fall in love just like I did. This blog I really just wanted to share a few pictures from our trip. Pink Tavern one of the oldest buildings in the country, preserved since the late 1600s. This was the preferred watering hole of some of the most fierce pirates in the Atlantic. Orginally this building was a fire station, Charleston has been destroyed by fire multiple times in its history. Then it was turned into a Slave Mart prior to the Civil War, now it is a museum that depicts the history of slavery in the South. Iron barriers like this are all over Charleston near fences, window, and doors used to protect the city under attack when it was under attack. "Charleston-style" house, the colors are heavily influenced by the Carribean as many early settlers were from the area. The color on the porch ceiling is called Haint Blue which protects the house from evil spirits. Provost Dungeon used to imprison pirates and those imprisoned during the Revolutionary War. Many lost their lives here or were sentenced to death while being held captive here. This building is shown on both the pirate tour and the ghost walk. This building is actually below sea level and was built on man-made land-fill. Bloody Alley shown on the ghost walk. This was a popular alley used for gentlemens duels, many lost their lives here. The building on the left that looks like a brown castle is the Old City Jail, one of the most haunted buildings in the country per the Travel channel. It is open for night tours. Rainbow Row, the coloring is heavily influenced by the Carribean as a way to reflect heat and keep the houses cool in the summer. Rivera Theater on King Street, one of the three sites for the original premiere of Gone with the Wind in 1939. In the movie Rhett Butler was a Charleston man. St Phillips Church, one of the oldest churches in the country. There are over 150 churches on the penisula in Charleston dubbing it the "Holy City". This church survived one of the most devastating earthquakes in the US with vibrations felt from Chicago down to Florida so the steeple is actually tilted. Two of the signers of the constitution are buried in its graveyard. Our Carriage Ride along Battery Street, two rivers connect here and feed into the Atlantic Ocean. South Carolina has several islands that can be seen in the horizon of this photo. Mom and I at Magnolias Resturant on East Bay Street. Forgive our appearance, we'd been walking around downtown Charleston the whole day on walking tours and it was super windy. I have never thought twice about buying makeup removing cleansing clothes to use on a daily basis. I always kept a box of the biore clothes (premoistened) in my bedside table to use as a luxury when I'm too tired (or too hungover in my college days) to remove makeup. 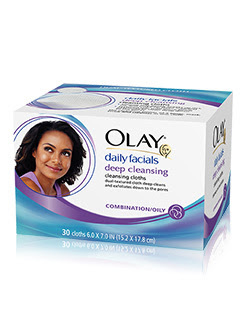 I picked the Olay Daily Cleansing Clothes up on a whim at the store when I was getting items for my trip to Charleston. The package states that the combination/oily clothes are dual textured and work as a cleanser, toner, scrub, and mask. I used them a couple of nights before I left to make sure they didn't irritate my skin and I was overall pleased with them. The claims on the package set the bar pretty high. I use the textured side first on my face and remove my eye makeup with the soft side. They definitely cleanse and remove face makeup well. Eye makeup doesn't come completely off but I line my water line so I always have to use a seperate remover to get my eyeliner off. The first few days I used a toner afterwards to see how well it removed makeup and there was nothing on the cotton ball. As a scrub I feel like it does a good job of removing dead skin but it's gentle enough you can use it daily. It definitely does not take the place of a mask but who needs a daily face mask? The best part is they are PERFECT to pack for a trip, I folded them flat and I didn't have to take my cleanser, toner and scrub. I'll definitely repurchase. Each box contains 30 wipes and costs around $6, I cut my wipes in half and now that I'm home I'll only be using them at night when I take my shower so I think the cost is pretty reasonable. I'll be watching for sales in the drugstore circulars and probably stock up. 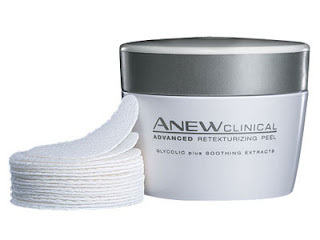 After reading all the great reviews on the Avon Anew Clinical Peel, I finally decided to check out the Avon website last week. It was on sale for $14.99 (usually $25) with free shipping on all orders over $5. I made the purchase and started used it for the first time 2 nights ago. Avon's instructions are to use the textured side of the moistened pad all over cleansed, dry skin every other day and follow with a moisturizer. They also warn about a possible tingly feeling after using it. I felt a very slight tingle and afterwards my face was a little tacky. The pads are so wet that I had plenty of product left after wiping my face and neck so I also did the back of my hands and followed with lotion. I will be using this peel per Avon's instructions and I'll report back when the container is finished. I don't have a lot of skin damage but there are two discolorations under my right eye that I am hoping this product will help lighten. I've only used it once, tonight will be the second time, but my first impressions are hopeful. It didn't irritate my sensitive skin and it wasn't overly drying. There are a lot of products in the Avon Anew Clinical line so if I like this I might try the serum or the eye cream next. After many months of impending doom, I finally moved out of my townhome and into an apartment only 10 minutes away from work. My new place is about 850 sq ft and all mine; this is my first experience without a roommate and I'm loving it so far. Living Room - I don't care for the odd coloring the camera flash is creating on my furniture. Microfiber does not photograph well. I tried taking the photo without flash and the coloring was more true but it was just too dark. The second picture is the other side of the living room. I have the tiniest window and I really don't like that it's located next to the patio door. Dining Area - I love my pub table, I have a leaf that can make it a larger square but it doesn't it well in this space. Kitchen - I love my kitchen, I wish this was a better picture; you can't see my decor on top of the cabinets that well. I have my casserole dish collection on my cabinet tops and a few cute signs and decor plates. Utility Room - Obviously my laundry room. There are small shelves to right as you walk in and I use them for storing my small kitchen appliances and Lilly's food and water are kept in this room. I usually keep the door partially closed so you don't have to look at my detergent bottles and Lilly can still get in and out. Bedroom - I have wall decor that I haven't found a place for yet but I know this room will probably look better with some color on the walls. Vanity Table - I keep my hair and makeup supplies in this corner. Closet - Walk-in closet, I just finished a 10 day work week so please excuse "the mess". Bathroom - The curtain in real life is a slightly darker red and on the other side of the sink I just have a couple of candle sticks. I'm loving my gigantic garden tub, I'm hoping to take full advantage of it, especially this winter. The second picture is Lilly's corner of the bathroom. Patio - This was a difficult picture to take. I'm hoping to get a few potted plants for some color out here. I noticed this getting posted quite a bit a few weeks ago and with the move I didn't get to post but I was playing with Polyvore today and decided to put it together, especially since my camera connector cord is still "who knows where". 1. Apply Korres Wild Rose Foundation with my Sigma flat foundation brush. 2. Apply MAC Studio Finish Concealer under my eyes (usually with my fingers). 3. Apply MAC Blot Powder (pressed or loose) with a fluffy brush lightly all over face. 4. Apply Laura Geller Bronze N Brighten in fair over the high points in my face with a fluffy brush. 5. Apply MAC Mineralized Blush Duo in Love Rock on apples of cheeks and blend towards the hairline. 6. Apply Two Faced Shadow Insurance (not pictured) on each eyelid and just underneath the outer corner of the eye. 7. Apply MAC Shroom eyeshadow over entire eye up to the brow bone with a wide eyeshadow brush. 8. Apply MAC Satin Taupe or Sable (boring I know) along outer V and blend upwards. I make a narrow V personally because my eyes are so big and round I really try to elongate my eye. 9. Line the eye with Kohl liner (I'll use any brand but I keep the Rimmel brand in my lab coat at work for touchups). I make my eyeliner thick on the outer corner and really thin towards the inner corner and I line my waterline on the bottom to make my eye appear less round. 10. Curl the lashes and apply L'Oreal Voluminous Mascara in Carbon Black lightly pulling the eyelashes towards the outer corner. I lightly apply mascara to the lower lashes. 11. Most days I use Maybelline Brow Pencil in Light Brown to add definition to my nearly non existent eyebrows and use Maybelline Define a Brow Gel to set it. 12. Usually as I'm running out the door I grab whatever lipstick or lipgloss I find first. I keep MAC Angel in my purse so it's a frequently used color. I guess now it's no secret here, I've wanted a new camera for a year now but I think it's become a necessity now. I have absolutely no idea where my connector cable is. I think it was accidentally taken when my ex moved out or possibly placed in my "donate" pile before I moved. 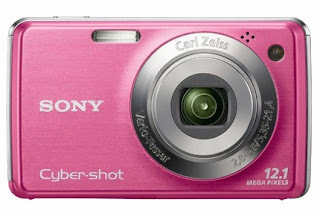 So I've been camera shopping and I really like the look of this one, if only because it's pink. Honestly the entire description above reads like Chinese to me, I have no idea what "stats" to look for in a camera. I certainly think this one would fit my needs for pictures and short movies, it's cute, the price is ok, and it has really good reviews on the sites I've checked. I'm hoping to purchase my new camera before I leave on my Charleston trip in mid-September. 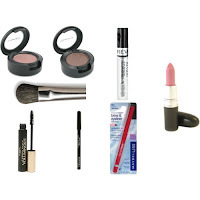 I few weeks ago I received a coupon via one of my magazines for $2.oo of any Revlon product. After a couple of trips to the Revlon section of my local drugstore I had decided that I would try one of their mineral lipglosses - the hourglass packaging is so darn cute I can't imagine anyone would pass them up. I also happened in on a BOGO for Revlon so I actually got two colors (score!). The gloss comes with a doe foot applicator and is lightly scented and lightly flavored with cake batter which I'm not wild about (but it goes away quickly). The staying power is great, first application the gloss stayed on through dinner, drinks and that night I fell asleep in my makeup (bad girl!) and it was on the next morning. On workdays I apply this around 7:00 am and I don't need to reapply until after work around 3:30 pm - yes it lasts through lunch. There is no need to apply balm underneath as it is quite moisturizing and you don't get that weird white ring on the inside of your mouth. 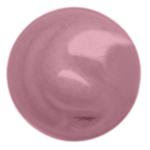 Eternal Blossom is a midtone bright pink that goes on slightly more sheer than the color in the bottle. The gold and silver reflects are tiny, as in you can't feel them on your lips, and the color is very wearable for fair to medium skin tones. Infinite Rose is a darker pinky-red with gold reflects, again it goes on a little more sheer than what you see in the bottle. This is a beautiful natural lip color that would compliment a wide variety of skin tones. 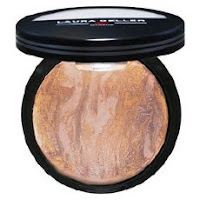 I wanted to review a couple of the Laura Geller Baked products that I purchased a few weeks ago. I've been using them daily and so far I'm liking the results. I wasn't sure about this when I saw it, the color looked a little too yellow in the container. As with all powder foundations you need to apply in thin layers and using a Kabuki brush is key. I love that this isn't nearly as messy as some of the loose powder mineral foundations I've used. The coverage is nice, it covers the reddness around my nose and on my chin and yet it is sheer enough to look like real skin. I don't need to set it with powder which is another plus and I don't feel like I get any shinier then on days when I do use blot powder. I still use blotting papers and touch up my face in the middle of the day. This is a great product to have on lazy days or to use while traveling. Love this. My container has baked swirls of dark brown, light brown, tan, and pink. I apply with a fluffy powder brush in broad circles around my face. The color is great - not muddy and not orange; perfect for daytime. The color can be applied in several layers for a summer look but I can also apply this in a sheer layer for the winter. Again, this is great to travel with and this will probably be my daily bronzer.